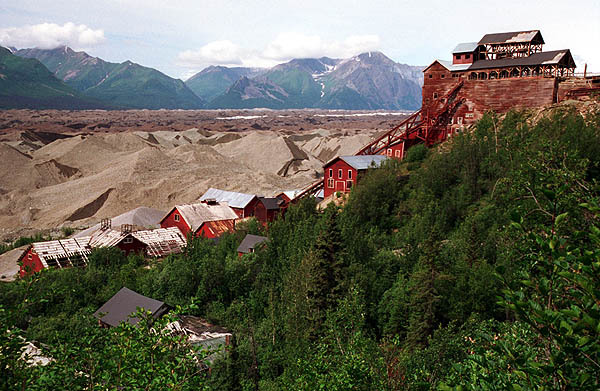 Next we drove to Kennicott, a former mining town located in Wrangell-St. Elias National Park. There are extensive ruins from the copper mining operation. Those are not mine tailings beyond the mine buildings; that's actually the Kennicott Glacier, which is covered by dirt and gravel. There's ice beneath a coating that ranges from 2 inches to 2 feet thick. To get to Kennicott, you have to drive 60 miles down a railway bed converted to dirt road (my brother found a railroad spike), walk across the Kennicott River on a footbridge, and get a shuttle bus to Kennicott. Once there we stayed at the Kennicott Glacier Lodge.